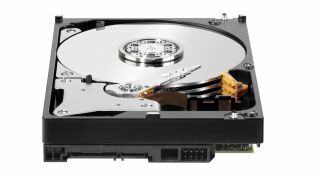 Western Digital has introduced a slew of new WD Red hard drives aimed at the network storage space, with new 2.5-inch variants available. The new, bigger, 3.5-inch drives boast up to a 4TB capacity, while the new 2.5-inch drives are available in 750GB and 1TB variants. Managed by NASware 2.0 technology, WD says it has compatibility-tested the WD Red drives with NAS system manufacturers (Synology was present at the launch we attended, for example, while others involved include Thecus and Qnap). WD says that not only is there demand for large capacity 3.5-inch drives for NAS, there is also an up-and-coming demand for smaller NAS units, hence the 2.5-inch variant. The WD Red drives are designed to reduce the power consumption of network storage and increase efficiency. Is there are market for small body NAS? We think the jury's out on small form factor (SFF) NAS, but with cloud storage still suffering from bandwith limitations, we can see the point of it in some mobile environments, as well as increasing capacity within existing one-box solutions. "WD defined the NAS drive category by leading the development of hard drives specifically built for small NAS environments," said Matt Rutledge, vice president of client storage for WD. "We also wanted to deliver a highly reliable and compatible 2.5-inch hard drive built specifically for small NAS. This small form factor enables our customers to use high capacity NAS hard drives with high performance, quiet operation and low power consumption in compact NAS enclosures. "We see an opportunity in smaller-footprint NAS systems, media players and other industrial applications." The WD Red NAS drives have a three year warranty and even include 24-7 telephone support. They're shipping now.